To say that there is some hype about this new 2010 Penfolds Grange is putting it mildly. With the 2010 St Henri getting 99 point scores and the 2008 Grange famously scoring 100/100 it seems only natural that this new 2010 will get at least one perfect score. What makes Grange so special is all about consistency – 60 years worth of wines, with even the lesser years typically looking pretty smart. Combine that with an excellent year (2010) that Peter Gago compares favourably with 1990 and you have a recipe for glory. 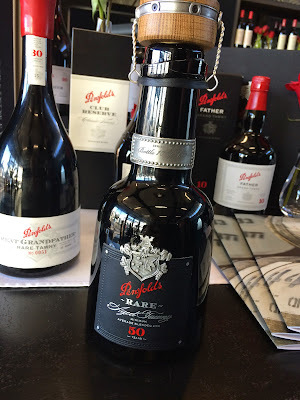 The Grange consistency was put under the microscope at the Penfolds Collection tasting, with not only the 2010 but also the 2008 and 2009 up for tasting. Happily, the wines delivered even better than I expected, the 2009 looking notably more lively than I can remember, the 2008 a very different style to the 2010 but still of a very high standard (and really not far behind the 2010). As a footnote we also had a sneak peak at the brand new 50 Year Old Rare Tawny – a super premium, amazingly packaged tawny drawn from some of the oldest stocks in the Penfolds cellar and bottled in tiny amounts. 98% Shiraz, 2% Cabernet Sauvignon. Barossa Valley, Clare Valley, Magill Estate. 19 months in 100% new American oak hogsheads. 14.5%. pH 3.48. TA 7g/L. $785. 98% Shiraz, 2% Cabernet Sauvignon. Barossa Valley, McLaren Vale, Clare Valley, Magill Estate. 18 months in 100% new American oak hogsheads. 14.5%. pH 3.53. TA 6.6g/L. $785. 96% Shiraz, 4% Cabernet Sauvignon. Barossa Valley, Clare Valley, Adelaide Hills, McLaren Vale, Magill Estate. 17 months in 100% new American oak hogsheads. 14.5%. pH 3.57. TA 6.9g/L. $785.